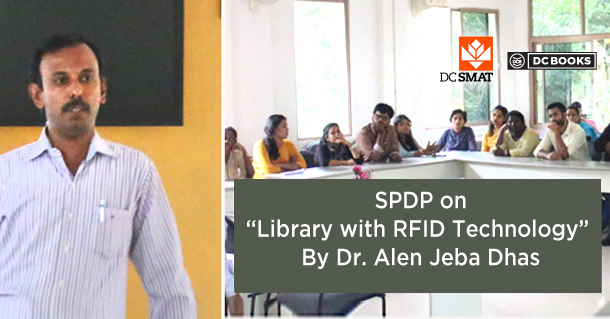 Responding to the changing tides in the field of education and technology, DCSMAT conducted a Staff Profession Development Program (SPDP) on the topic ‘Library with RFID Technology’. The session showcased the latest trends in library science incorporating RFID technology presented by Dr.D. Alen Jeba Dhas, librarian at DCSMAT. The presentation included an introduction of RFID technologies, the need for RFID in libraries and the benefits derived from the adoption of this technology. Radio Frequency Identification, refers to a technology whereby digital data encoded in RFID tags are captured by a reader via radio waves, similar to barcoding. The session which was conducted on April 9th focussed on the advantages of RFID over several other systems that use barcode asset tracking software. The presentation concluded with an interactive session.